You may recall the other day I mentioned trying McDonald’s new breakfast sandwich, the chicken biscuit; well, even if you don’t my stomach did. While I wasn’t a fan, it seems you were, because we got a ton of reader interest about the review; so I sacrificed my bowels via a second trip to McD’s for the lunch-version. See the image to the right? That is the product image. And for once, the real thing looked exactly like the published product image. Unfortunately, that was not a good thing since literally this is basically a huge chicken nugget on dry white bread with two pickle slices. No mayo, no ketchup, no lettuce, zilch. While I do enjoy a chicken nugget on some white bread, I have to say this was pretty sad. So skip it. Similar to my last visit, the store was simply chaotic. But as usual, McDonald’s is trialing some new technology to improve through-put, and I was impressed. A woman was working her way up and down the lines of people with a handheld, wireless device to take orders. She used it to take my order, by the time I got to the register I simply had to pay. It looked like there were kinks to be hammered out, such as getting the food out more quickly, but I like the system in general. posted by Lon	at 09:28 AM	Filed under Restaurants, Take-out/Delivery. You can follow any responses to this entry through the RSS 2.0 feed. Both comments and pings are currently closed. The product has butter, it is not actually dry. I love it. It reminds me of the very popular Chick-Fil-A product. Anonymous, according to McDonald’s nutrition facts, it’s made with liquid margarine (eww!). There’s no butter anywhere in the sandwich. Oh–I love when they come up to you with those headphones and take your order while you’re in line at the counter or at the drive-through. It’s only happened to me a couple of times in my life, but I think it’s awesome customer service! edamame, thanks for visiting us! asianmommy, we agree, when you’re eating fast food, that’s what you want FAST food. K&S;, funny, I’ve never tried chick-fil-a and I’m going to pass on this one. Carol, the one thing I’ll eat at McD’s is french fries. 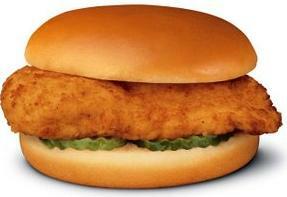 well, it pretty much is a close duplicate of the Chick-fil-a chicken sandwich with a slightly different roll. if you compare the seasonings of the 2 competing sandwiches, they are very similar:) mcdonald’s = food whore.